10th September, 2016: The appeal is pleased to confirm that we will be attending the Burtonwood nostalgic weekend on Saturday the 17th and Sunday the 18th September. The event is to be held at the Burtonwood Heritage Centre. 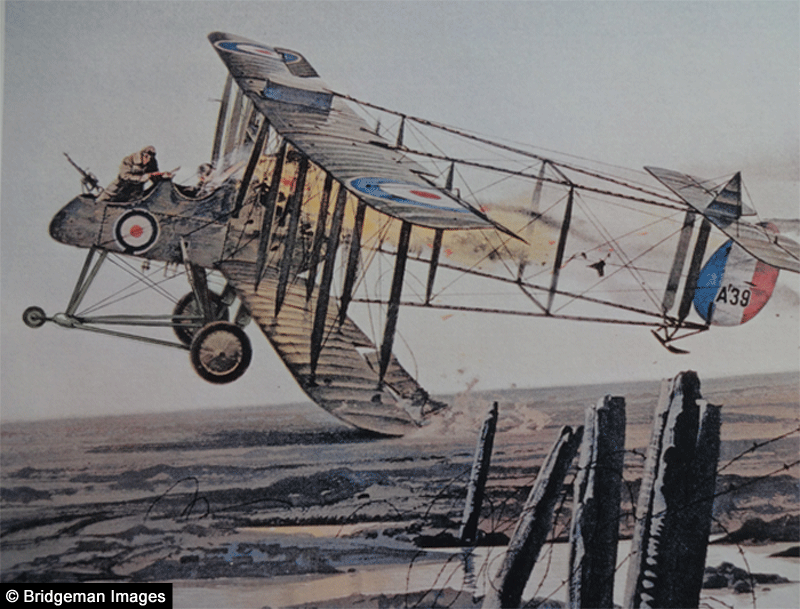 More information can be found at the RAF Burtonwood website. 28th April, 2016: The appeal will be at the Cheshire Steam Fair in Daresbury on the Saturday & Sunday 9th/10th July. 19th January, 2016: Thursday evening 24th March at the Fords Sports And Social Club, Widnes a 7 pm start. It's a White Collar boxing event with local members of the public, mainly with no boxing experience training for eight weeks then entering the ring to face there opponent. Safety is our priority with large 18oz gloves Head Guards qualified Referee and a Doctor on site. We don't promote rivalry just a team effort to raise as much money as possible for charity. We give the boxers a great ring walk to their piece of music flanked by security through the crowd to add to the excitement. All money raised on the night will go to the Sgt Thomas Mottershead statue Appeal. *UPDATE* 28/4/16: The appeal would to pass on our thanks to everyone who attended the above event last month. A great night was had by all, and to top it off we raised just over a thousand pounds for the appeal. Many thanks again to Nigel Spencer and his wife Debbie for making the event such a success. The Echo also covered the event in detail online. 19th January, 2016:The Kingsley Players have agreed to stage their much acclaimed production of Allo Allo for us on the evening of Friday 19th February. The start time is to be 7.30pm at the Studio in Lacey Street, Widnes. Attendees will be encouraged to wear French type clothing to fit in with the cafe (But don't have to!). Hot food is to be included with the ticket price. More information about this event can be found on our Facebook page. 11th January, 2016: The appeal will be having a bucket collection on the 14th February, 2016 during the Widnes Vikings V Leeds Rhinos game. More information about this upcoming fixture can be found on the Widnes Vikings website. 16th November, 2015: Click here to read the full story behind our Red Arrows flypast application. 12th November, 2015: Christmas prize bingo at the Bowling Club in Widnes. Eyes down at 8pm. 19th September, 2015: Race night at the Simms Cross Institute. 26th/27th September, 2015: North West Vintage Rally, Victoria Psrk, Widnes. 17th/18th October, 2015: We will be packing bags at ASDA, Widnes. New Relative found in Australia! The Appeal was thrilled to make contact with Cynthia Williams (Tom's Granddaughter) last month. One of our local papers covered the story in great detail in late March. The full article can be found on the Runcorn And Widnes Weekly News Website. Sat 29 Nov>, 7pm sharp! Songs To The Cenotaph Gig- FREE At The Studio , Lacey Street Widnes, WA8 7SQ. Sun 30 Nov, 1pm-2pm - Songs To The Cenotaph sharing at Victoria Park Glasshouses, Widnes. The Appeal will also be appearing at Widnes Market on the 6th, 13th and 20th December. On the 20th December we will be with Vocalise, who will be singing Xmas Carols. More information about this event can be found on the Widnes Market Events page. 8-12-14: The Appeal has received a very generous donation of 200 pounds from Cammell Laird. Our first December stall day was also a great success and we raised just over 112 pound! We would like to thank both Cammell Laird and the patrons of Widnes Market for these generous donations. The appeal was thrilled this week to accept a very generous donation from Mr. Michael English. One of our local papers has covered the story in great detail today. Please visit the the Runcorn & Widnes Weekly News website for the full story. THE Sgt. 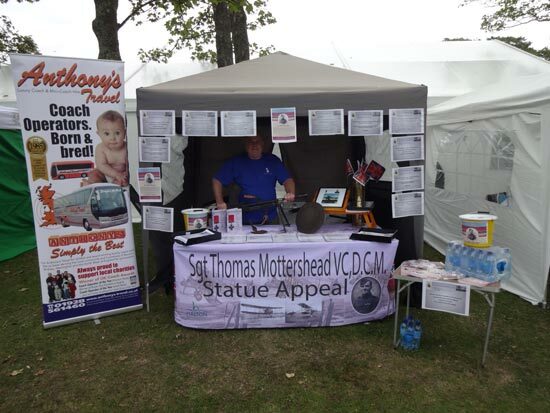 THOMAS MOTTERSHEAD STATUE APPEAL has received a cheque for 5,000 pounds towards the Appeal. At this moment in time we cannot name the donor. But if they agree we will publish their name. To the donor, THANK YOU, YOU ARE A TOP PERSON. 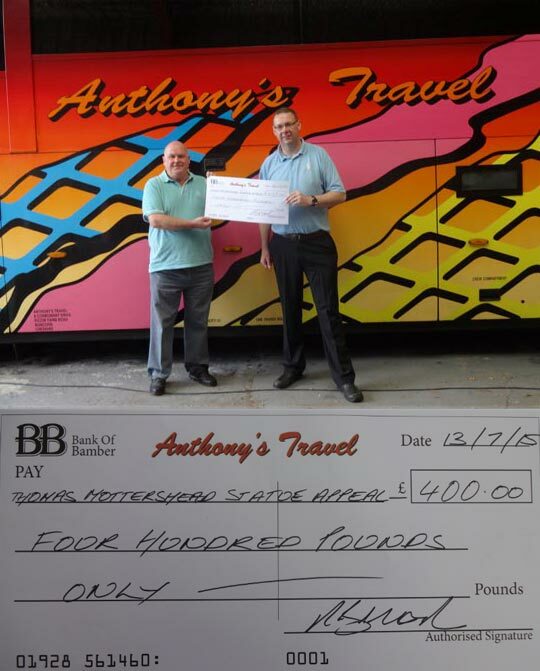 A massive thank you to everyone at Anthony's Travel for the generous donation of four hundred pounds. Pictured above is Founder, Tony Miller accepting the cheque on behalf of the appeal. Thank you to everyone who visited our stand last month. We had some great feedback and we made over two hundred pounds for the appeal in donations! Thanks to everyone for the generosity shown over the weekend. We can now confirm that the Statue will be sited by the memorial stones at the entrance of Victoria Park, Widnes. The appeal has officially launched! 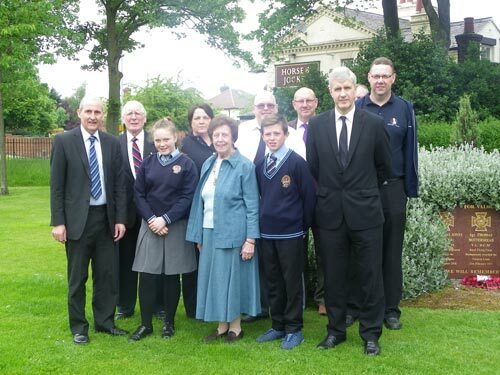 The appeal had an official launch in Victoria Park, Widnes on Tuesday the 20th May. 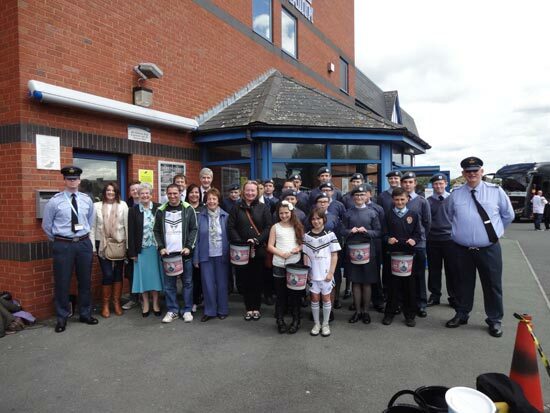 The event was covered by both local papers, the Widnes World and the Runcorn & Widnes Weekly News.